Thomson's Begonia is a herb 15-30 cm high, fleshy; rootstock tuberous. Leaves are basal and on stem; blade 6.5-9.8 x 6.9-9.5 cm, oblique, heart-shaped, densely hairy on both the surfaces, sawtoothed, fringed with hairs, pointed; leaf-stalks 4.8-11.5 cm; stipules obvate, tapering, densely hairy, persistent. Flowers are borne in leaf-axils paired cyme of 4-18 flowers, carried on a flower-cluster-stalk 3.5-7.2 cm tall. Male flowers have 2 sepals, obovate, 0.8-0.9 cm, hairy; 2 petals, lanceshaped, 0.7-0.8 x 0.4-0.5 cm; stamens 60, monadelphous; anthers obovoid; filament longer than the anthers. Female flower have 5 tepals; outer tepals ovate, velvet-hairy on the ventral surface; inner tepals gradually smaller; ovary shaggy. Fruit is 3 winged; two wings 0.4-0.5 cm long ; third wing 1.2-1.4 cm long; seeds ellipsoid, brown. 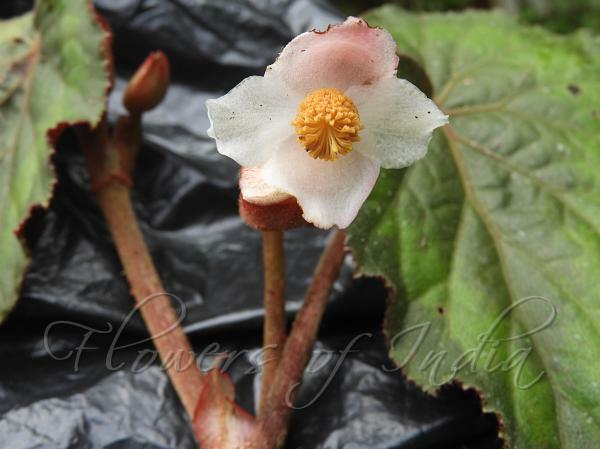 Thomson's Begonia is found in NE India at altitudes of 250-1800 m. Flowering: June-October. Identification credit: Mark Hughes Photographed in Lamahatta, Darjeeling.